THE SKINNY: I never expected to love argan oil. The very thought of rubbing a few drops of oil into my fine hair sounds so disastrous. But after using Orofluido Beauty Elixir for a few weeks, I'm sold. It doesn't leave my hair greasy. And now that colder weather has set it, this product leaves it feeling healthy, bouncy and free of static. 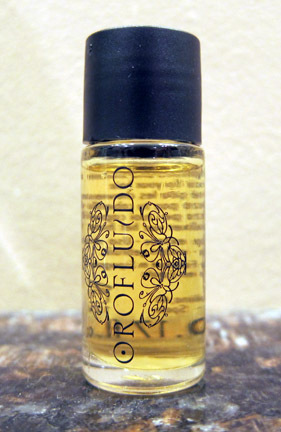 Orofluido mixes argan, linseed and cyperus oils with a warm vanilla scent that I keep getting hints of it throughout the day. Argan oil is made of Vitamin E and other fatty goodness that strengthens hair without weighing it down. Linseed oil is added for shine. Cyperus adds softness and volume. Yes, volume. This product gives my hair a lot of bounce. If you're not familiar with argan oils, here's what you do. Wash your hair as you normally would. Put a few drops of the oil into your palm (my short hair needs about two drops), rub your hands together and then massage into damp hair. Then dry normally. KEEP OR TOSS: Keep. I will probably buy more of this. And maybe just for the scent. CHECK IT OUT: Orofluido came in a Birchbox package. Otherwise, it's sold in salons.